I personally love all about poinsettia, although it’s just the artificial one. Poinsettia can bring Christmas classic atmosphere to your house. Poinsettia or Flor de la Noche Buena (The Flower of Holy Night) is a native Mexican plant. The Indian Aztec from central Mexico grew the plant and used this plant to make a reddish purple dye. On the 17th century, Poinsettias were used by Mexican Franciscan priests to celebrate the Fiesta of Santa Pesebre (a native Mexican procession). So, how Poinsettia can be spread around the world? 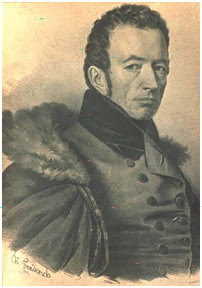 On 1828, a US ambassador for Mexico, Joel Robert Poinsett (picture above), brought this pretty plant to the United States. Now, we know where the name of Poinsettia came from. Furthermore, on 1834, a US nursery man, Robert Buist, brought poinsettia to Europe. Then, in 1900s, it became a part of American Christmas tradition. In fact, in the US, there is a National Poinsettia Day on December 12, to honor Joel Poinsett and the poinsettia. Talking about Christmas, without legend surround it, is not complete. Poinsettia also has it own story. Long time ago, on a Christmas Eve, a poor little boy walked to the church with the purpose to celebrate Christmas. But, he was too poor to buy a gift to be put in the manger. Then, on his road to church, an angel appeared to him and asked him to take weeds from the side of road as gift to baby Jesus. After that, he put the weeds in the manger and began to pray. Magically, the weeds transformed into star shaped flowers of bright red. That now we call it Poinsettia. 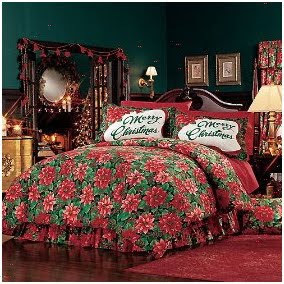 Today the beautiful flower of Poinsettia can be seen on the Christmas stocking, table cloth, bedding set, and many more. 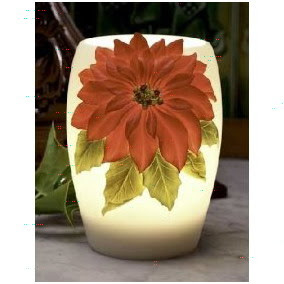 Yup, poinsettias become inspiration for creative people to be applied on many goods, like you can see below. Enjoy……. This cute night lamp is casted on bonded marble and hand painted. The dimension is approximately 4" w x 5" h. Have an on/off switch cord. The bulb is included (15 watt standard Candelabra bulb). On the snowy Christmas, you may need your tea stays warm to bring out the coziness from the cold weather. 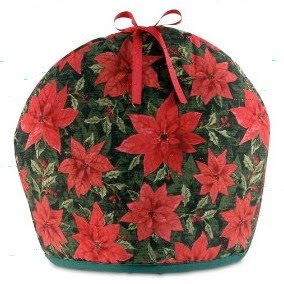 So, this Tea Cozy Christmas Poinsettias Dome is very suitable for you. It fits all teapots up to 6 cups and has extra thick insulated lining in order to make your tea stays warm. It can be washable, hand wash, and line dry. 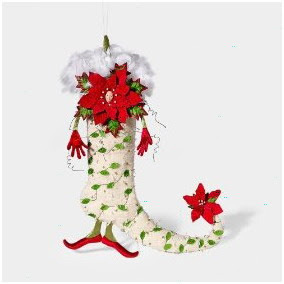 It’s very feminine Christmas stocking. Even Santa Claus will commend it . So girls, hang it on your mantle on this Christmas. This toilet tattoo is made in USA from electrostatic vinyl film. 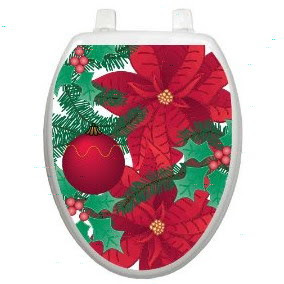 It is removable, reusable, decorative appliqué for the toilet lid. Available to fit round and elongated toilets; round (actual size 12-inch X 13.5-inch) and elongated (12- inch X 15-inch). It’s made to used on standard smooth toilet seats (not for soft cushion seats or brown wooden seats). So, how to use it? You can apply by using water for the plastic lids. Make your bed full of Poinsettia flowers! It is a genuine licensed merchandise and machine washable. One full size comforter 80 x 86 inches (193 cm x 218 cm). Two standard pillowshams, to fit 21 x 27 inch (53 x 69 cm) pillows. One full bed size bed-skirt to fit a standard full mattress of 54 x 75 inches (137 x 191 cm).